The year 2018 was a slow one where the original Yamato saga is concerned, but quality is always better than quantity when it comes to our favorite anime classic. The 40th anniversaries of both Farewell to Yamato and Yamato 2 inexplicably came and went without fanfare, but a lot of interesting things still happened between the releases of Yamato 2202 chapters 4-6. Stepping back slightly, this CD popped onto the Cosmo DNA radar several months after its initial release. It’s worthy of note for being a collection of theme songs by Yamato’s original lyricist Yu Aku, from the worlds of anime and tokusatsu (live-action special effects) TV shows. They are all covered by contemporary artists in modern styles, and include such fare as Ultraman and Mach Baron. It makes our list for the inclusion of two Yamato songs from 1978: The Rival (Dessler’s “image song”) performed by Ryotaro Okiayu (voice of Jiro Shima in Resurrection) and From Yamato With Love performed by Koichi Yamadera (voice of Dessler in 2199 and 2202). As we learned from 2202 press coverage, this was the song that convinced the producers to have him render the ending theme for Chapter 6. Keep reading for more about lyricist Yu Aku. Kentaro Haneda’s magnum opus was the “closing note” on the original production years, and has been covered at length elsewhere on this website. Hustle Copy published sheet music for all four movements, allowing symphonies around the world to take up the challenge of this massive, complex body of work. Order it from Rakuten (ships to Japanese addresses only) here. One of the most revered traditions of the original Yamato production years was a strong presence on radio with frequent appearances by staff & cast members, and especially the live four-hour late night radio dramas for the feature films. On May 5, that tradition was revived by FM station Clover Radio located in Saitama Prefecture, covering the cities of Asaka, Wako, Shiki, and Niiza. This 4-hour special program was all about Yamato music, broadcast from 2 to 6pm on May 5. Hosted by DJ “Apple,” the content was provided by manga artist Michio Murakawa, “Fukushige Infinite Music Study” (host of the Yamato Music website) and “Andro Umeda” (self-described soundtrack lover). They even had a celebrity guest in for conversation: anime auteur Hideki Anno, another lifetime Yamato fan. As enjoyable as the show was, peppered with beloved favorites and eye-opening rarities alike, the best part was the online response; on the broadcast day, the social media hashtag for the show trended first nationwide. Afterward, each hour was rerun separately (twice per day) from May 8-11 at 6am and 7pm. This year it is forty years since the big hit movie Farewell to Yamato. While we wait for the theatrical release of Yamato 2202 Chapter 5 on May 25, a four-hour special program devoted to the music of Space Battleship Yamato will be broadcast on FM station Clover Radio in Saitama Prefecture, with net delivery to Yamato music fans nationwide. We’ll look back at the monumental achievement of this music that has affected a wide range of generations, from nostalgic pieces to the latest works with guest commentary and listener requests. DJ Apple is the main personality behind anime and tokusatsu programs on Clover Radio. Guests will include manga artist Michio Murakawa, who participates in Yamato 2202, and Mr. Fushige who hosts the Yamato Music website. There are more than 1000 Yamato songs old and new with rich and unusual sound sources. We’ll hear and compare many different versions of famous themes. We expect to examine various rare pieces and discuss the new work Yamato 2202. There has never before been a four-hour program devoted to Yamato music, and we propose to fully promote the appeal of Space Battleship Yamato. Three very lucky listeners won these Michio Murakawa originals, photos of which were posted on Twitter by DJ Apple May 21. Do you remember that hot blood of Yamato? The first story of the anime Space Battleship Yamato (1974) opens with that unforgettable narration and the translucent vocals of Kazuko Kawashima. In the year 2199, planet bombs have rained down indiscriminately in an attack from Gamilas, and Earth moves toward its end days. The beautiful, mysterious woman Starsha reaches out a lone helping hand from 148,000 light years away. A radiation removal device must be retrieved from the Planet Iscandar in the Large Magellanic Cloud. With the fate of humanity in the balance, Space Battleship Yamato launches in the third episode of the TV anime version. The human race has 363 days left. The date is October 9, 2199. In other words…181 years from today. The lyrics for the opening theme Space Battleship Yamato and the ending theme The Scarlet Scarf were written by the hand of Yu Aku. As a maestro of popular songs, Yu Aku’s work history is remembered by many, but not many remember the songs he wrote for children: Ping Pong Pang Exercise (1971, winner of the 14th Japan Records Nursery Rhyme Award), Wild Seven (1972), Devil Man no Uta (1972), Microid S (1973), Fireman (1973), Ultraman Taro (1973), Red Baron (1973), Mach Baron (1974), Ultraman Leo (1974) and more. We should keep in mind that he dealt with many anime and tokusatsu songs for children’s programs around the same time as Yamato. When we look back, the first A-side single debut for the music of Yu Aku was Toppo Gigio’s One-Two Kazoe Uta (1966), and if we look back even further, he found his way as an aspiring screenwriter for the Nobuhiro Corporation to becoming a lyricist with big hit Moonlight Mask (1958). It can be said that the bond between Yu Aku and children’s programs was strong and deep. That said, Yu Aku was never limited to clearly-understood, child-friendly lyrics. This is where we should look closely at how the lyrics for Space Battleship Yamato and The Scarlet Scarf were based on the whole story of Yamato. That story encompasses determination, separation, heavy responsibility, challenge, hope, nostalgia, and love. Could all of those elements be contained in a very limited number of words? If Yu Aku had simply grasped Yamato as “the story of a battleship flying through space and killing an enemy,” that would not be the case. Naturally, the lyrics for a TV theme song must be created before the start of the broadcast, so most of the work must be done without viewing the main story. Moreover, there are few visual images in a script and proposal book. With only a few documents and not much information to go on, the scent of the program’s appeal must be spun into words from the goals of the producer, and it’s always a difficult task to capture this in the lyrics for standard popular songs. However, Yu Aku created his lyrics after watching the overall story of Yamato on film [the 1974 pilot film], writing carefully while reviewing the content. His ability to see the whole story from a little information and “sniff out” the appeal of the program was exceptionally sharp. Again, he had joined the Nobuhiro Corporation with the goal of becoming a screenwriter, and was trained at the production site of TV commercials, which required maximum impact with few images and words. This may have been the experience out of which Yu Aku formed his technique. By the way, have you noticed that some common words appear in the lyrics for both of the Yamato theme songs? Space, departure, all the way, I will certainly return, man, romance, and so on. By simply looking at these words, you can feel the essence of the Yamato story. Among these, there is a presence that stands out conspicuously, though it may seem out of place: romance. Other words express the outline of the story concept, and they are very straightforward in terms of anime TV theme songs for boys. But “romance” is different. This is a word that doesn’t come out unless you explore the internal “mind” of a character or story. At the same time, it is an “adult” word, not intentionally aimed at children. At the time of 1974 TV anime, there was no such thing as “romance.” Yu Aku used his sharp senses to trim every other word and arrive at that, the true core of Yamato’s appeal, which had not been seen in anime before. When it came down to just one word, “Romance” was the conclusion. Space Battleship Yamato was produced under the extraordinary determination of the staff to complete a real SF anime which would overturn the common perception of Japanese TV anime that preceded it. In fact, it is said that TV Manga was elevated into Anime with this work. It succeeded in raising the age of the viewership by breaking through the common notion that “anime is for children.” The historical transformation Yamato would bring was quietly foreseen in the keywords of both theme songs before the program began. They were embedded as an audacious, hidden command by the visionary power of Yu Aku. Now that he has become a star, he is smiling from across space. This is the face that comes to my eyes. Read Cosmo DNA’s tribute to Yu Aku here. For those looking to practice the Yamato theme on electric organ, Electone brought you one step closer by publishing a version in this issue. Order it from Amazon.co.jp here. Not everything in 2018 was limited to Japan. 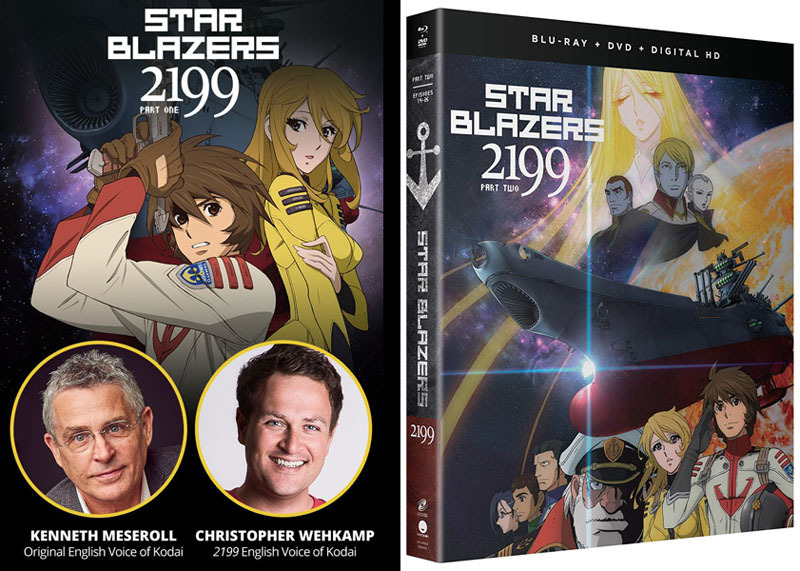 Early in the year, the Syfy channel’s website Syfy Wire published a glowing tribute to Star Blazers by lifetime fan Michelle Villanueva. Read her article here, and her Yamato 2199 followup here. Original text by Hiroshi Nakamura. See the story at Yahoo Japan here. 45 years after her debut, Harumi Ichiryusai has continued her 25-year journey to pursue the “art of storytelling.” Her old stage name was Yoko Asagami, and Space Battleship Yamato was the turning point that made her a legend in the anime world when she took on the role of heroine Yuki Mori. At the age of 40, she decided to pursue voice, expression, and dramatic acting, and flung herself into this traditional art with a 500-year history. Today at 65, she has the same youthful voice as Yuki Mori, who she played at age 20 and now considers to be “my treasure.” She thanks Leiji Matsumoto for this, who looked at a signed photo of her and drew her face onto Yuki. She also took on the roles of the beautiful detective Saeko Nogami in City Hunter and Glass Claire in Galaxy Express 999, gaining popularity as a top voice actor who portrayed mature women. But her motivation for the art of storytelling did not stop there. In 1992, she became a disciple of the living national treasure Teisui Ichiryusai and trained in traditional Japanese storytelling. She reached full proficiency in 2004 and has fascinated audiences with her ability to play any role and change the atmosphere of a story with her voice alone. In addition to cultivating voice actors, she gives university lectures and develops curricula as director of a two-year voice training program at a school in Chuo, Tokyo. To add further depth to her voice, she began studying psychology at 65. “There is no end point in life, and I want to continue in the direction light leads me.” Her journey in pursuit of storytelling that began with Yamato still continues. Visit her Twitter page here. For purebred psycho-fans, the undisputed highlight of 2018 came from a little-known company called Fukkan Publishing. In one year, they brought out large-format keepsake editions of Leiji Matsumoto’s original manga that reduced all previous versions to footnotes. Boukenou [Adventure King] was the original monthly manga magazine that featured Matsumoto’s Yamato manga in serial form, first in 1974-75 and then again from 1978-80. The name is invoked for these reprints because they present the material in original monthly format with all original color and chapter breaks intact. Moreover, they go back to the 7.25” x 10” page size, which is larger than any previous reprint (except for a single 1979 edition from Akita Shoten that remains incomplete). This is NOT a simple repackaging of the many paperbacks that have been in print since 1975; they featured revised and alternate pages, including the shrouded appearance of Captain Harlock. Those pages are in these volumes, but separated and distinct from the restored Boukenou format. Contains the entire 6-chapter serial for the Iscandar story plus Matsumoto’s picture story serial from Fifth Grader magazine, the Eternal Story of Jura spinoff chapter, other illustrations from the same time frame, revised pages done for paperback reprints, an original featurette called Cosmo Road Alpha, and production art from the Series 1 development phase. See Fukkan’s home page for this volume here. Order it from Amazon.co.jp here. Contains the first 6 chapters of the Comet Empire story plus the previously-unreprinted New Voyage manga from Third Grader magazine (2 chapters by Minoru Nonaka) and three chapters of Hiroshi Aizawa’s Yamato III manga from 1980/81. Also includes revised reprint pages and development materials from Farewell to Yamato. Contains chapters 7-16 of Matsumoto’s Comet Empire manga (which was never concluded), a short story titled Cosmo Road Omega, the rest of the Yamato III manga, an interview with Yutaka Izubuchi (read it here) and design materials from Yamato III. Due to an oversight, the first chapter of the Yamato III manga appears at the end of this volume rather than in the previous volume. Order it from Amazon.co.jp here. Showa 40 Otoko is a bimonthly magazine published by Crete Planning Box with a very specific target audience: Japanese men born in 1965. It’s actually a bit broader than that, but men born in that year experienced a heavy dose of pop culture and social change that always seemed to have them in its crosshairs, not the least of which was the chance to see Space Battleship Yamato at the very ripe age of 9 or 10; precisely the right time to get the full impact and ride it all the way to 1983 when they were 18 and 19. Thus, examinations of Yamato come up on a fairly regular basis, especially when they fit into themed issues. Two such articles appeared in 2018, both of which are presented here. In 2015, journalist Hiroyuki Ota wrote a serial for the Asahi Shimbun newspaper called hereFollowing Space Battleship Yamato, in which he examined the unique cultural aspects of the anime. In November 2018, he returned to the subject for a deeper dive that explored the attitudes and principle figures of the Imperial Japanese Navy that informed the storytelling of the first Yamato series. Through special arrangement with Mr. Ota, we can present this entire 10-part serial in full. Click here and settle in for a fascinating read. This thick volume provides an extensive overview of Matsumoto’s manga career, dividing up his enormous number of titles into genre categories and punctuating it with interviews, side projects, and actual comics. Other books have done the same, but this one is the thickest and contains a larger amount of illustrations than its predecessors. Despite the promise of its title, this large format magazine is entirely occupied with the various iterations of Captain Harlock and Galaxy Express 999 with no space given to Matsumoto’s many other anime productions. That’s no reason to bypass it, since the coverage is still comprehensive and colorful, but you’ll need to look elsewhere for lesser-known anime titles. Although Great Analysis contained no Yamato coverage, this montage illustration appeared at the end of the book with previously-unseen character art. The artist’s name was not indicated. Matsumoto’s management company organizes several live events every year, and 2018’s rounds began in February with a traveling exhibition called Legend of the Manga World Leiji Matsumoto. Starting in Nagoya, it made monthly stops in various art spaces across Japan. He made his first in-person appearance (a talk show & autograph session) at a Daimaru shopping center on May 20. Billboard for the June-to-July stop at the Fukui City Art Museum. Display boards at Fukui, including a manga page into which you could insert yourself. Posted on Twitter by Yamada. Another stop went from August 28 to September 4 at a Daimaru department store in Tokyo, the highlight of which was the release of a new watercolor print depicting the arrival of the Galaxy Express 999 at Tokyo Station. This was added to the lineup of other merchandise that always goes on sale at such exhibitions. The last and longest of the year’s Legend of the Manga World exhibitions was held from October 27 to December 24 at the Kumamoto Prefectural Art Museum. Maetel herself was on hand to welcome weekend visitors, and one of the exhibits was a large, previously-unseen Yamato model. (Yep, there’s another big one out there.) Both photos were posted via the museum’s Twitter account. The annual highlight for Matsumoto devotees is always the one-day mini-con Leiji Future. December 16 brought everyone together for the 13th time at the Culture Culture bar/music club in Tokyo. As usual, the first half of the day was filled up with a live-drawing and autograph session, lunch featured a mini-concert and shopping for exclusive merch, and the second half was all talk show. A projector allowed everyone to watch Matsumoto’s live-drawing session. Here he works on a sketch of Captain Okita. Photos posted on Twitter by Aoi2199. One highlight of the first half was a photo-presentation of Matsumoto’s appearance at the Lucca Comics & Games convention in Italy. And one of the talkshow guests happened to be Yamato 2202 scriptwriter Hideki Oka. Check in at the official Matsumoto website Skulldot for photos and more. This oddly-situated Yamato model first appeared in 2015 out in the Hiroshima countryside, and has been occasionally photo-documented since then. It’s a bit on the weathered side, but it’s still standing in these photos posted to Twitter by Kougakoringo. See a 2014 video encounter with the model on Youtube here. Twitter user Hirokatsu Kihara posted this photo of a press clipping from a friend’s scrapbook. Given the presence of Captain Harlock, the only known use of the character in promotion, this must have been a very early ad for Series 1. The other artwork is directly lifted out of the 1974 pilot film. Toshio Masuda and Leiji Matsumoto are credited, and the sponsor list beneath their names (Lotte, Pioneer, etc.) confirms the time frame. THIS SHOULD BE IN A MUSEUM!! Yamato fan Aoi2199 shared this interesting find on Twitter, direct from the Hamanako Music Box Museum, which specializes in automatic musical instruments. This metal disc predates LP records and was designed to play on a music box called a Polyphon which dates back to 1870. This particular disc, for reasons that defy explanation, contains the Yamato theme. It’s not often that a forgotten artifact emerges from the fog of history, but that’s exactly what happened when Twitter user Yosuke Okunari dredged up a manga adaptation of The New Voyage. One reason we probably didn’t know of it earlier is that it’s quite short; only two chapters, drawn by Minoru Nonaka, ran in Shogakukan’s Third Grader magazine in December 1979 and January 1980. When it later appeared in the second volume of Fukkan’s Cosmoship Yamato 2, it was revealed to be only 40 pages long – too short for a paperback reprint. Fukkan’s reprint of The New Voyage leaves something to be desired, since the reproduction quality is a step down from the rest of their work. Thus, the hunt is on to find the original issues of Third Grader and bring this artifact directly to you, the loyal Cosmo DNA readers. Stay tuned. On the subject of museum pieces, this is truly one for the record books. A single copy of the very first Yamato plan book (written by Eiichi Yamamoto in 1973) was listed at Yahoo Japan Auctions on April 16. Competition was ferocious with over 300 bids, and the auction closed April 22 at 801010 yen (Close to $8,000 US). See a handful of photos from the auction listing here. Read the content of the book here. Digging into a very obscure corner of Yamato world, we have these photos posted on Twitter by Aly2203. It’s a workbook showcasing a variety of fonts all using the words Saraba Space Battleship Yamato as a subject. Aly2203 remembered encountering this book in junior high and was amazed to find it in a used bookstore. Twitter user “Kuro2202” shared this photo of previously-unknown artifacts found at an uncle’s house. They cover Yamato news from the original production years, but their formatting doesn’t match anything from the official fan club. The likely explanation is that they were circulated by a private club, but until more evidence emerges we can only speculate. What’s Spaceship Starsha? It was to be the principle vessel in Dessler’s War, the unproduced Yamato sequel that got as far as a plot and a few concept drawings before Yoshinobu Nishizaki abandoned it. Everyone was reminded of it when Twitter user wtpakira posted this art (by Makoto Kobayashi) to compare it with Space Battleship Ginga from Yamato 2202. Read all about Dessler’s War here. Tomonori Kogawa is a core member of the Yamato family, having designed and directed characters for both Farewell to Yamato (1978) and Resurrection (2009), and drawing key animation for Gatlantis scenes in 2202. This is in addition to a long and storied anime career, which you can read about here. He is known to donate his time and energy to charitable causes, which he did again on September 2 for disaster relief. The day consisted of a lecture on his career, a Q&A segment, a raffle for original art drawn on the spot, and various products for sale. 2202 Assistant Director Makoto Kobayashi stopped in for a guest appearance. Photos posted on Twitter by 24murataka and Shiromaru. On September 8, a fan with the handle of Warajiro 1 posted this photo of a discovery in Kanto (Chiba Prefecture), a hand-drawn vintage Yamato on the side of a paint shop. The passion lives on wherever you look for it. These small decorative panels, pictured here close to actual size, reside in a subcategory of “mystery products” released in the early 2000s, probably from the world of DIY garage kits. Twitter user Ryota claimed to find them in their father’s collection and posted the single best photo (so far) of them both. If anyone reading this has more info about them, please comment at the end of this page. Syd Mead’s Japanese Twitter page made it known that an art show would land in Japan April 2017, which in and of itself is cool enough. What makes it MORE interesting is that, being a Japan-based event, it will include pieces from his Japanese collaborations – namely the long-lost Yamato 2520. Doubtless there will be more to follow up on when the event arrives in 2019. Meanwhile, visit the event website here. The last “vintage” event of the year came on December 21 when one more historical piece was listed at Yahoo Japan Auctions. It’s a concept painting from Final Yamato by designer Tsuji Tadanao that was only published once (in a 1982 This is Animation book) and then vanished…until now. It was listed for about $5,000 US but could not find a buyer. Sad as that may be for Mr. Tadanao, it makes for a nice closeout to our look back at 2018.